Ashangbam Minaketan Singh was a popular literary figure from Manipur. He is regarded as the founder of modern Manipuri literature. Singh was famous as a writer of prose, poetry and essays. 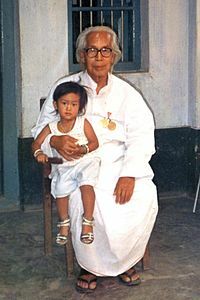 Ashangbam Minaketan Singh was born on 2nd May 1906 in Wangkhei to Ashangbam Jivan Singh and Medhabati Devi. He was brought up in a family of royal descendants. He graduated from Calcutta University in Arts in the year 1930 and mastered different languages as English, Bengali, Hindi, Sanskrit and Manipuri language. Ashangbam Minaketan Singh is a name to be reckoned with among the pioneer poets of Manipuri literature. He belonged to the generation of the people who grew up facing the difficult times of the socio-economic condition of Manipur. Ashangbam Minaketan Singh died in the year 1995 of heart failure. Ashangbam Minaketan Singh has worked as a lecturer of Manipur College from the year 1962 to 1982 and also the principal of the Thoubal College from the year 1982 to 1983. He has also served as the secretary of the Board of Secondary Education of Manipur. Ashangbam Minaketan Singh has penned many poems, plays and essays. His famous works include poetry work like ‘Basanta Sheireng’, ‘Asheibagi Nityaipod’, ‘Asheibagi Sheirol’, play like ‘Tonu Laijinglembi’, essay like ‘ Bharatki Lonsingi Marakta’ and criticism work like ‘Meitei Upanyas’. His published works include more than 25 books on different branches of literature. Ashangbam Minaketan Singh has been a recipient of a number of awards. He was awarded the prestigious Padma Shri Award in the year 1985 for his contribution in the field of literature and education. He was recognized as the honorary fellow by the Manipur State Kala Academy and was awarded the Sahitya Ratna by the Manipuri Sahitya Parishad. He was also awarded the Kavi Samrat by the Thangal Marup, Hailakandi, Cachar, the Soviet Land Nehru Award in the year 1977 and the Sahitya Academy Award for the poetry collection ‘Asheibagi Nityaipod’ in the year 1977. He was also awarded the Shubharna Jayanti Sanman Award, the Jamini Sunder Guha Gold Medal, the Thoibi Award and the Lalit Memorial Gold Medal.